Whether you set up a tailgate for two or for twenty, it's always fun to put a little extra effort into the decor - having a festive orange and purple tailgate setup will put anyone in the Clemson spirit. I was reading the August issue of RealSimple magazine last night, and found out about a Web site for party decor called PlumParty.com. I decided to check it out and found a lot of cute items and ideas that would make any Clemson tailgate stand out. These items would also make fun 'thank you for feeding me all season' gifts for the hosts of tailgates that you frequent. First, stock up your tailgate with orange and purple plastic cups. PlumParty.com has 24 packs of 9 oz. cups made of heavy duty quality plastic for only $4.25. 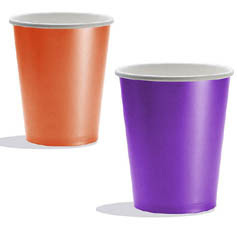 Scroll a little down on their site below the cups and you'll find links to other serving accessories in the identical color, like purple and orange napkins in packs of 50 for only $4.25. Pack a permanent marker and make sure you write everyone's names on the cups so they can use it the entire day - makes for less waste. Or buy some cheap orange or puple ribbon at Walmart and glue them around the bottom, middle, or top of each cup to create an additional flair (floozy cup?) and also help your tailgaters identify their cups. PlumParty.com also offers some adorable placemats to jazz up your tailgate. Use a solid purple tablecloth and offset your spreads of food by placing them on these funky orange and white placemats. Or, if you've got an orange tablecloth, try out these summery, purple tiki placemats that are 50% off their original price - so you get a pack of 4 for only $11! Place one under your utensils, another under your hot dips, and another under your sweets and desserts - it adds a little interest and depth to your table. Or place them together in a row down the center of your table to make your own table runner. And you're not limited to use them just for tailgating - they'll also come in handy at home. 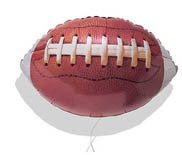 Add some fun to your tailgate and try out these inflatable football baloons. You'll get a set of 10 for $38.00 - plenty for the entire football season! Stop by a gift store, grocery store, or dollar store on your way into town and get these inflated. Tie them with gift ribbon to your tailgate tent. Not only do they make for fun decorations, but it will make it easier for your friends to find your tailgate... "Look for the floating footballs". Finally, during the October and November games, the wind picks up quite a bit - how often are you scrambling after your paper plates? putting keys on top of your napkins to keep them from blowing away? 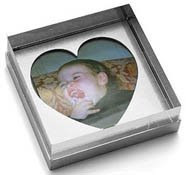 Why not purchase some adorable photo frame paper weights. Print out cute pictures of your kids in their Clemson attire, or of you and your friends from past Clemson games, or even pictures from your Clemson glory days... and put them into this paper weight frame. You only need three or so - spread them out on your table to keep your tablecloth from blowing up. Put one on your napkin stack, another on your plates. These can be reused and pictures changed out the entire season! Finally, I wanted to share another tailgate-must accessory. Plastic plates with built in cup-holders! 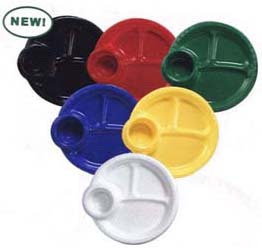 You can find these at most party supply stores (Party City), or purchase them online, like from this Web site, cateringsupplies.com, who offers 16 of the plates in various colors for only $8.35. Unfortunately, this Web site doesn't have orange or purple... but white would work! Your tailgaters will love the convenience of these. So what other tailgate decor or accessories do you use for your tailgates? Do you have any tailgate ideas to share with us? Email us or post a comment to this blog.